When you’re in the food blogging and social media industry, traveling is the added “perk” at times. Whether you’re traveling 10% of your time or up to 85% of your time, those travel perks soon tend to become travel nuisances. Having to pack a toiletry bag is probably the activity I hate the most and as minimalist as I try to be, I end up with a bag packed to the brim with lotion, face cream, eye creams, and so much more. Use it to calm yourself after a hectic travel day. Lavender is known for it’s relaxing qualities, and Organic Bath uses pure Bulgarian Lavender to achieve the highest results of calm. Dab a it of oil on your temples for full relaxation. Replace your body lotion: a couple of pumps and your body will thank you for the great moisturizer! The lightweight oil absorbs instantly. Moisturize your body while traveling, specially during long flights. The biggest tip a flight attendant will give you on long flights is to stay hydrated and that means your skin as well! Control flyways and nourish split ends. One thing I hate packing is hair products. I never know what I need so I tend to pack everything from hair spray to gel and mousse. After traveling with Stress Less, I realized it was all I needed for quick hair touch ups. 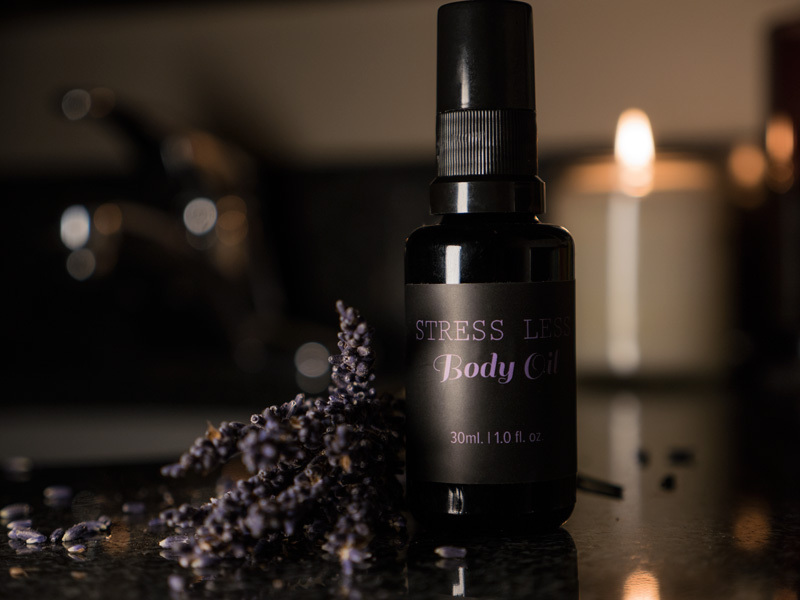 So next time you’re packing your travel bags, make sure to include a bottle of Stress Less Lavender Oil! Other products in the Stress Less line include: body butter, body scrub, and body wash. Safe travels!